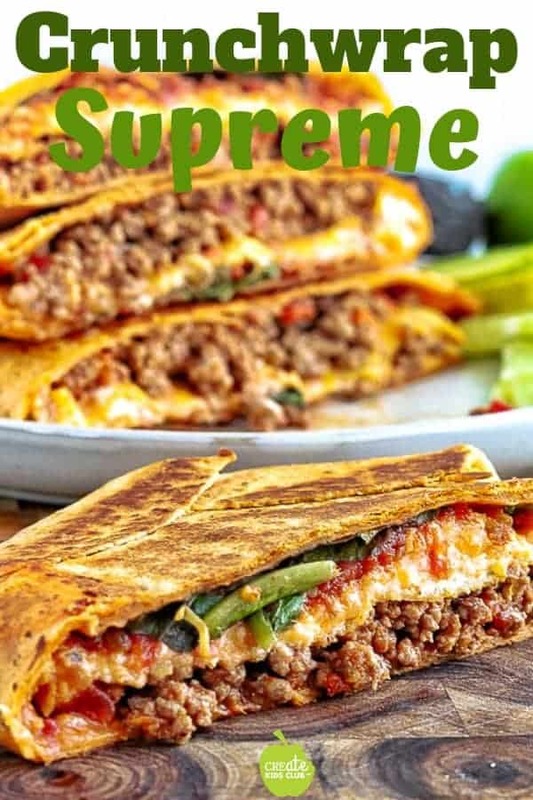 This is not your ordinary Crunch Wrap Supreme Recipe! 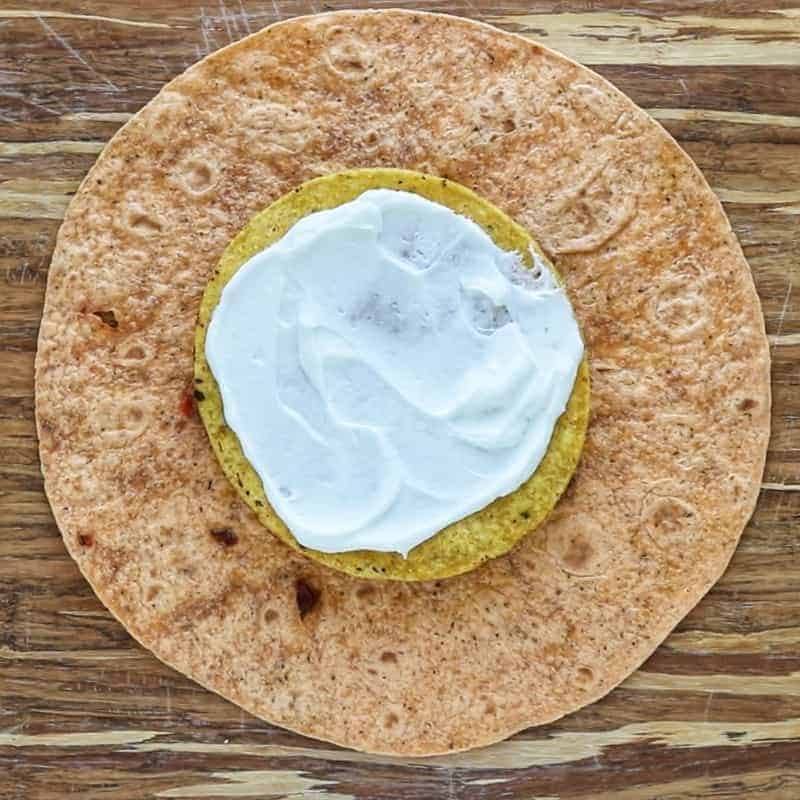 This Crunch Wrap recipe uses flavored tortillas, greek yogurt, and a romaine lettuce blend amping up this simple but delicious recipe! I am a proud partner of Tomato Wellness, who has sponsored this post. As always, all options are my own. If you’re like me, you’ve hit up Taco Bell a time or two in the late evening hours. The crunch of the tostada, the tomatoes, the cheese, the lettuce, all wrapped into a handheld meal. I decided it was time to tackle this recipe at home – trying to make it even better – was it possible? 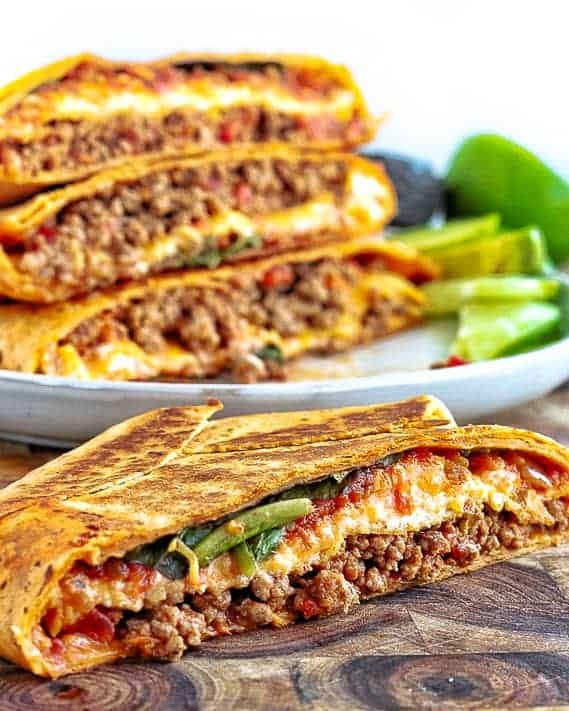 Check out how to make these this Crunch Wrap Recipe in the video below and share with family or friends who would also enjoy! 1. 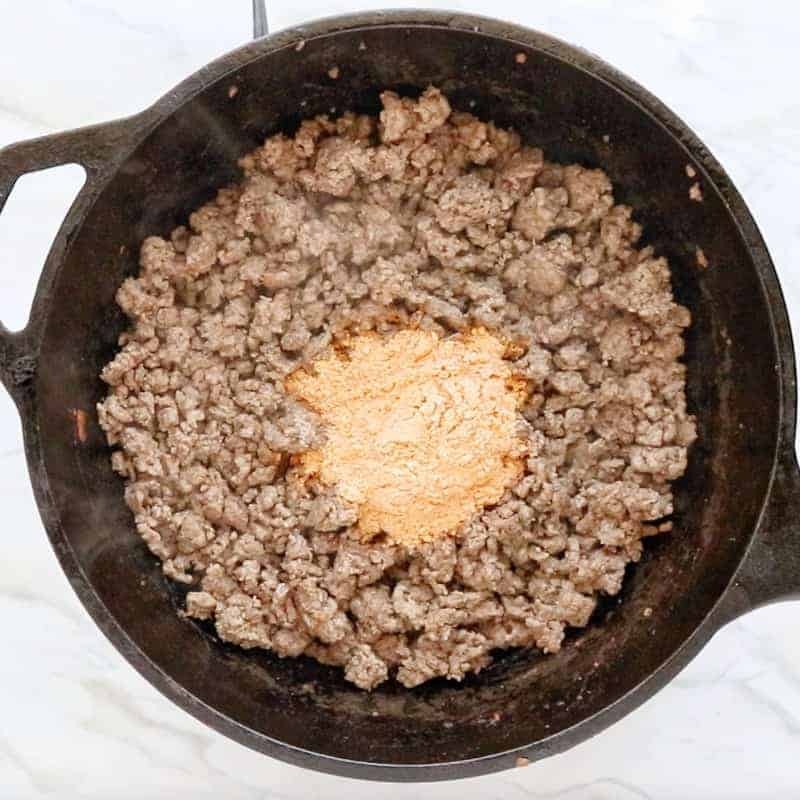 Start by browning ground beef with taco seasoning. 2. 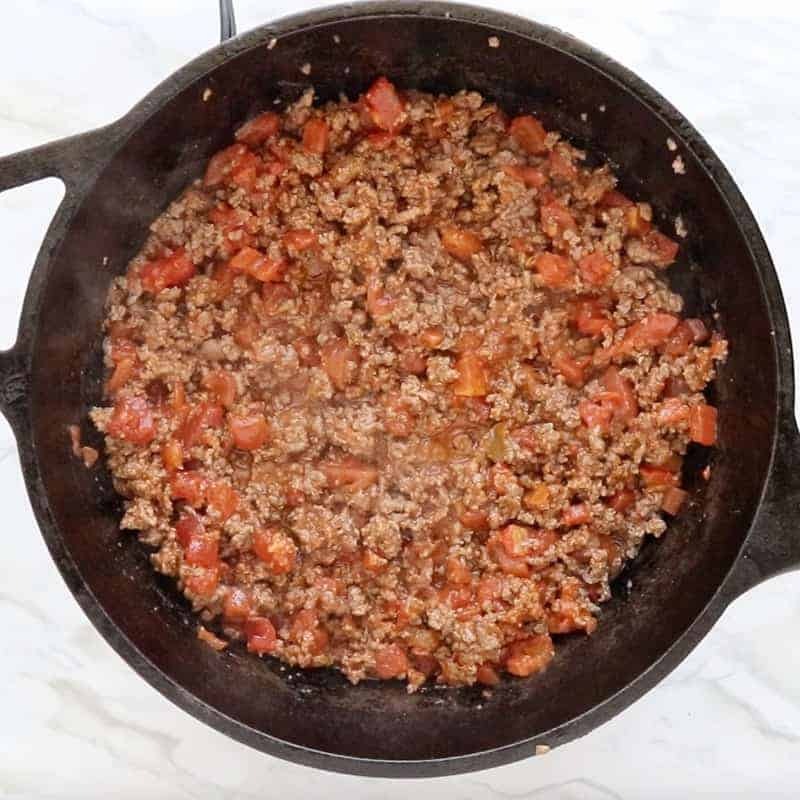 Add a can of your favorite diced tomatoes. I used a variety with green chilies in it and it was so good! I love tomatoes for so many reasons, but here in Wisconsin, oftentimes it’s really expensive to get fresh tomatoes or they just don’t taste as good as they do fresh from the garden. At these times, I lean on canned tomatoes. Canned tomatoes are a nutrient dense superfood containing high quantities of antioxidants. Lycopene is an impressive antioxidant found in watermelons, pink grapefruits, apricots, and is found in particularly high amounts in tomatoes. Lycopene is shown to help lower the risk of heart disease, prostate cancer, and macular degeneration, or poor eyesight as you get older. During the canning process, tomatoes are cooked right in the can. Lycopene has been found to be more absorbable by the body in its cooked form. So canned tomatoes actually have more of the cancer-fighting lycopene than the raw variety. Sounds good to me! 3. 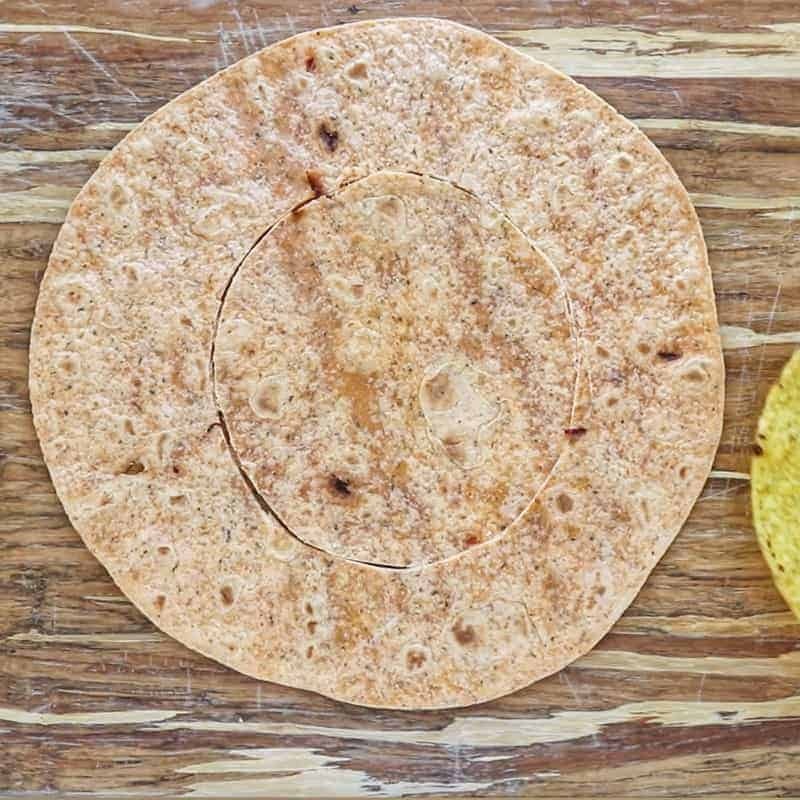 Use a tostada as a guide to trace around to cut out a circle from a whole tortilla. This will cover the bottom of the crunch wrap recipe. You can skip this if you can find large enough tortilla shells! 4. 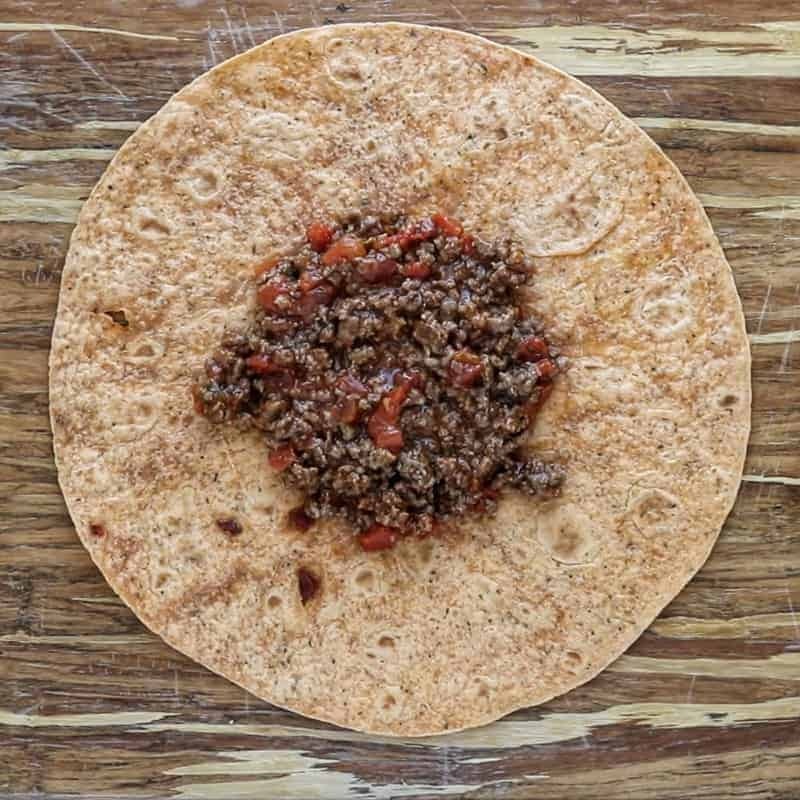 Start by layering the meat mixture onto a whole tortilla (not the cut one). 5. Add a tostada then spread tostada with Greek yogurt. 5. Add cheese and salsa. 7. Place the cut-out tortilla circle on top. 8. Then wrap the sides in. 9. Using a pan or griddle, coat the bottom with non-stick cooking spray or brush with oil. Cook each side over medium heat, for 3 minutes, or until browned. 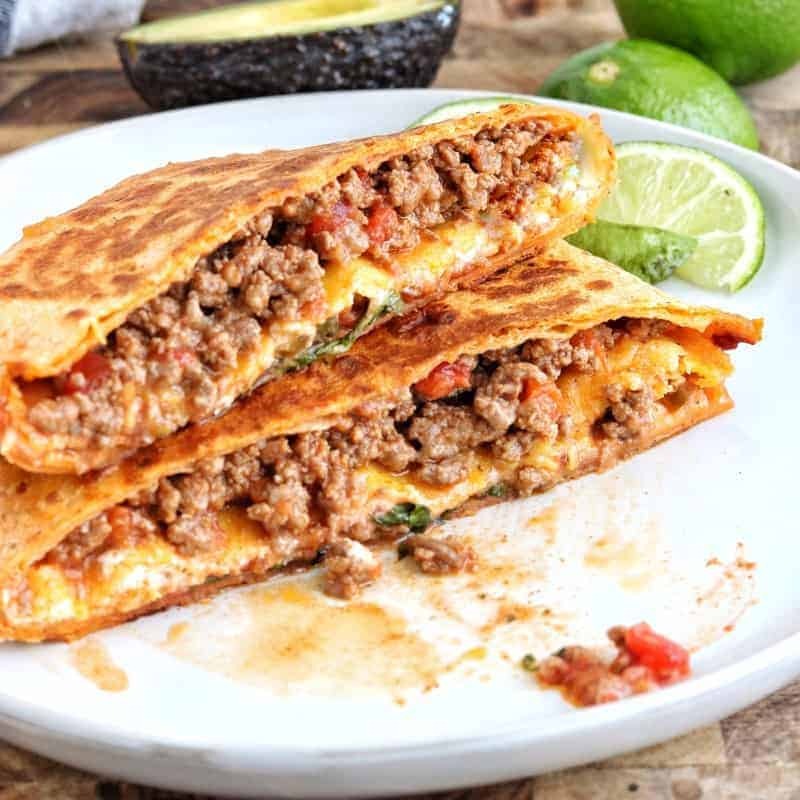 A simple and delicious Crunch Wrap Supreme dinner that rivals the Taco Bell version. Learn how to easily make this quick dinner recipe. Add the packet of taco seasoning and can of diced tomatoes. Stir, then remove from heat. Heat a clean pan, or griddle, over medium heat. Place tostada shell on top of a tortilla. 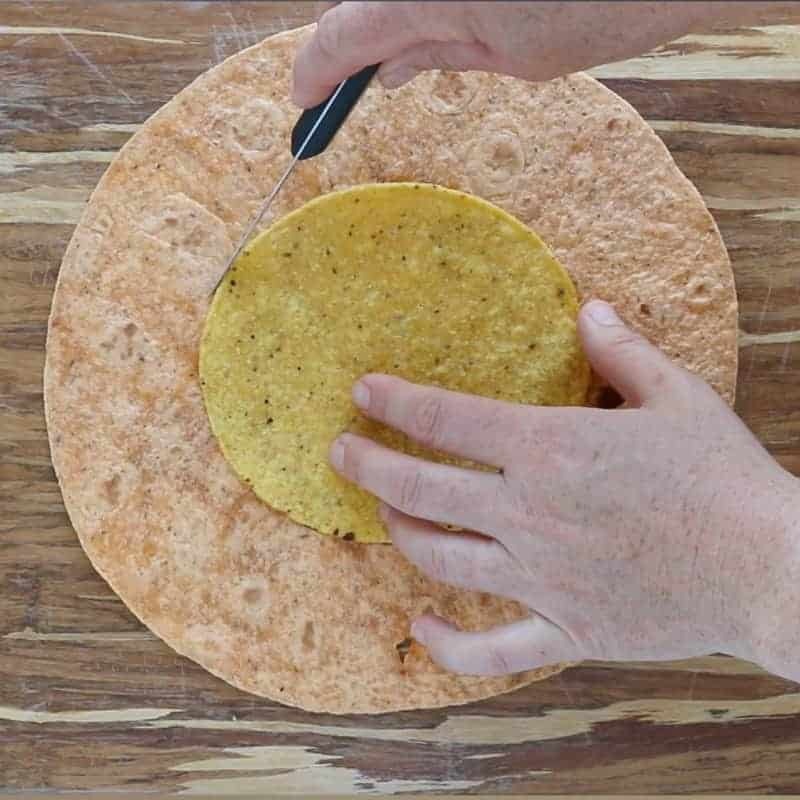 Use tostada as a stencil to trace around to cut out a smaller circle in the center of the tortilla. Repeat until you have 6 circles. Onto whole tortillas, divide meat mixture evenly into center of tortilla. Place a tostada on top of the meat. Spread Greek yogurt onto tostadas. Add cheese, salsa, and lettuce on top of the tostada. Top with the cut smaller tortilla circles, then bend corners of large tortilla around the top to seal shut. Spray pan or griddle with non-stick cooking spray or brush with oil. 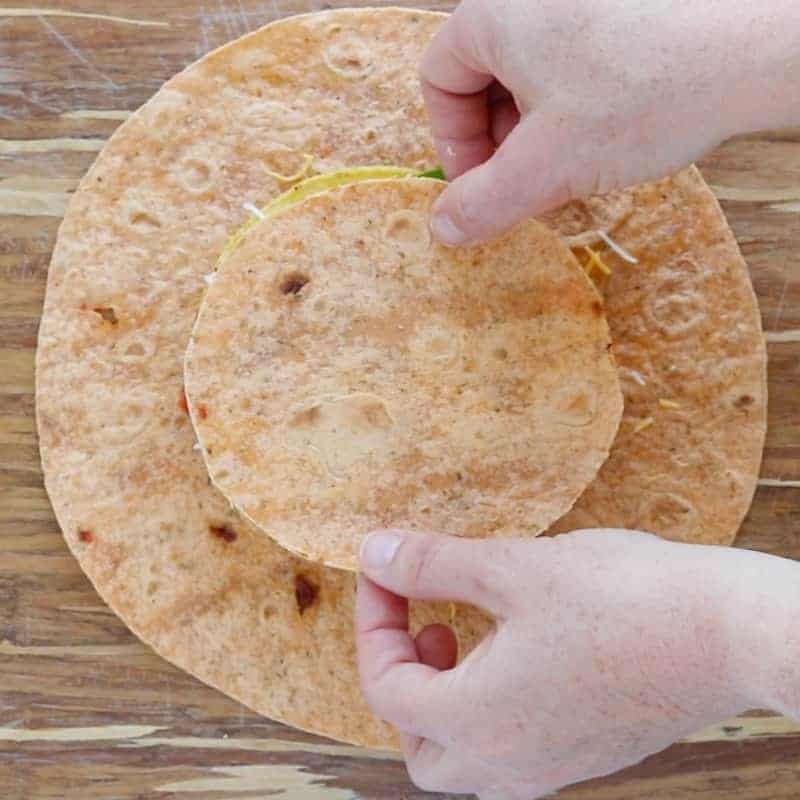 Cook crunch wrap for 3 minutes on each side, or until browned. Top Crunch Wrap with avocado, freshly squeezed lime juice or cilantro, if desired. I was really mouth watering over the video and glad I got to see it on the blog too great photos and this surely looks like something everyone will love here in our home great video btw! Now that looks so cool. I love how easy you make it look. I would make a big mess out of that. Love the flavors and love how beautifully you wrapped it. I. AM. HERE. FOR. THIS. RECIPE! 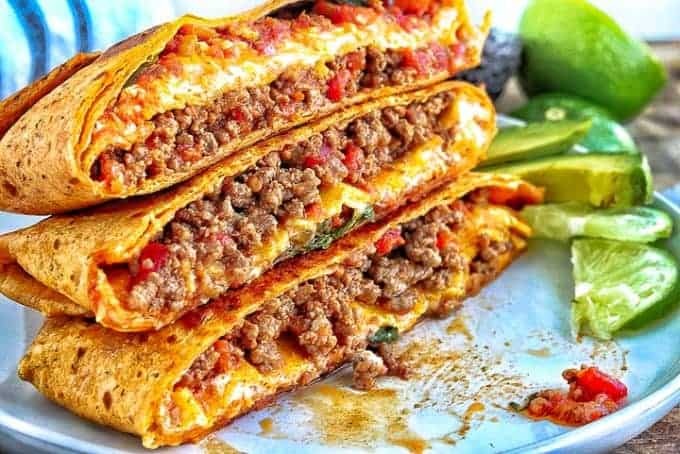 I’m not even ashamed to say that I’ve always wanted to try the crunch wrap supreme but couldn’t bring myself to go to Taco Bell for it. Their food always look amazing in their ads but definitely are not as… packed when you purchase it. I’ve been meaning to DIY it but never got around to it. Thanks for this recipe! Thank you for detailed instructions, it helps a lot! 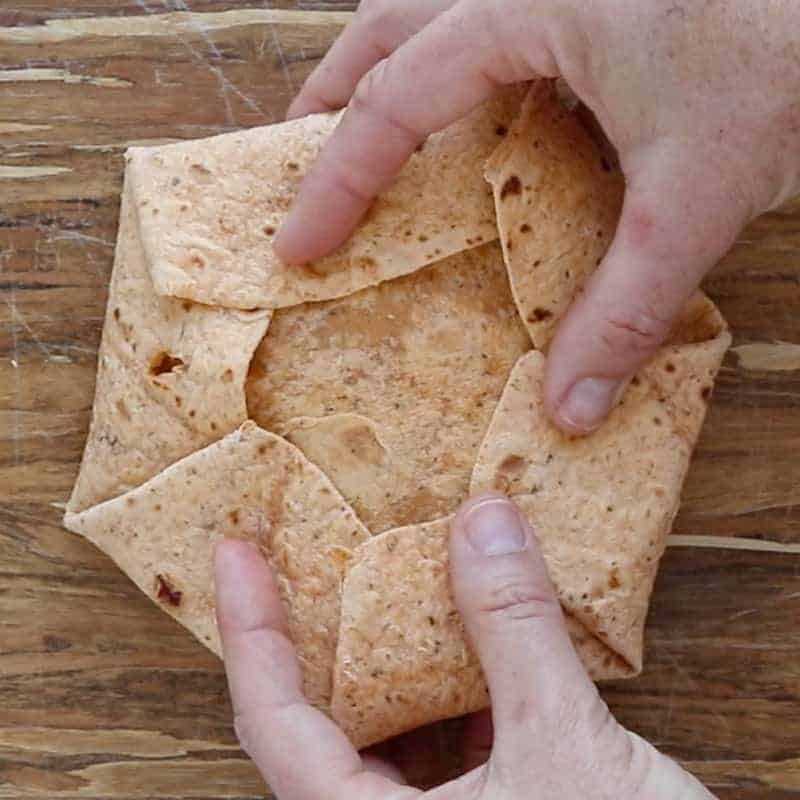 Very creative way to fold a tortilla, i will definitely give it a try! You’re welcome, Ruchi! I hope it helps! What a cute idea!! I love how you made it into a filled “pita”. This would go over big time during game Sunday!! The flavors sound delicious and I’m sure the crunchy wraps would be gone in no time. Oh this looks so good! I’ve seen these around a lot lately and would love to give them a try. I know my family would thoroughly enjoy these. Thanks, Catherine! I hope your family enjoys! Talk about a reason not to leave the house!! Now that you showed how to make these at home, I can’t wait to give it a whirl. Very informative blog post and a simple, delicious recipe. Thanks, Heather! I hope you do give them a try!